You might be in the fortunate position of being able to downsize and free up some cash by moving, but for most of us, moving to a new house is a financial stretch. It’s not just that you’ve maxed out your mortgage capacity to its limit, there are all those add-ons, surveys, fees, utility bills to be settled and then on top of that comes the cost of moving. Without careful planning you can waste a lot of money and make your life much more stressful, so here are some suggestions for ways to save money and make your move go smoothly. You will need a suitable vehicle, which will probably mean hiring a van. What size van will you need? What mileage is involved and how long will you need the van for? Don’t underestimate the difficulty of the task or the time it will take. Make sure that you have hired the van for a sufficient amount of time, you don’t want to be racing to get a van unloaded in order to return it on time. Remember that by the end of the day you and your helpers will be tired, and your work rate will slow down. 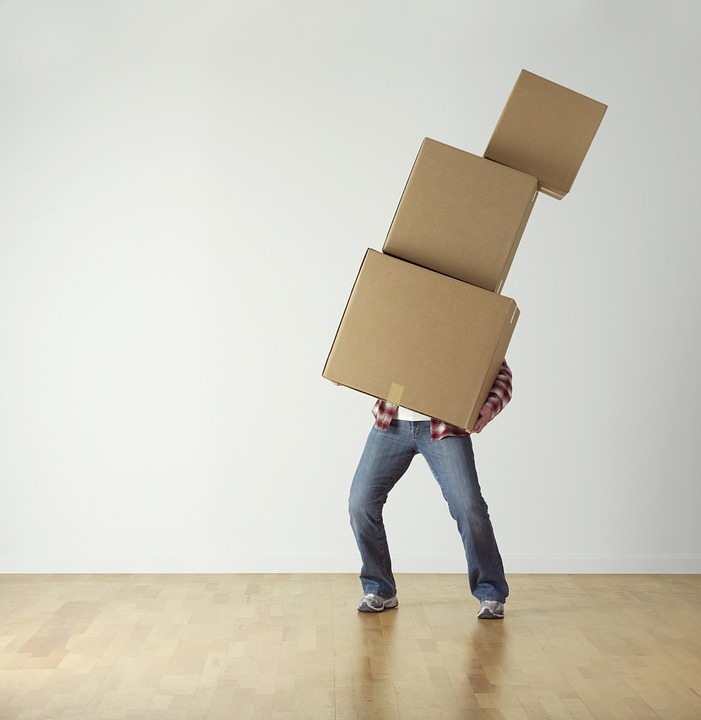 Moving heavy objects requires expertise as well as physical strength. If you or a companion injury yourself whilst moving it could end up costing you far more than hiring professionals in the first place. Investing in some key equipment will reduce the risk of injury and make moving heavy objects easier. An upright, two-wheeled hand truck is a great way to move heavy objects over flat surfaces and a flat base with swivel wheels will make moving furniture easier. You can also buy or rent furniture sliders which will help protect floors when you are dragging furniture. These are small round or oval plastic discs that slip under the feet of furniture. They have a soft base which slides over the floor without catching or scratching. It is possible for one person to move large pieces of furniture with these sliders. However they will not help you at all if you need to lift furniture over a doorway or step. Shoulder harnesses / moving straps enable two people to carry a sofa (and other large objects) without taking all the strain on their hands and arms (see video below). You’ll also need old blankets and duvets for protecting furniture when it’s loaded and some elastic straps and ratchet straps so that you can tie things down securely. Work gloves will help protect those tender hands of yours and a toolkit is essential for dismantling beds and shelving etc. Secure all bolts, screws and fixings in clearly labelled bags and make a note of how things come apart in order to avoid wall punching frustration when you reassemble! Use your phone to take pictures as you take furniture apart so you remember how to re-assemble it. It is a big job and there are costs to doing it yourself – buying and hiring equipment and the van. Do not underestimate the amount of work involved and be honest about your physical capability to undertaking your own move. Can you rely on people to help you? Before you even start to consider the DIY option, you should compare quotes from a range of removal companies so that you can decide if the DIY option makes sense. Start collecting well in advance. You want sturdy boxes which are not too large. Packing will always take far longer than you imagine so give yourself plenty of time. You’ll need a supply of newspapers and magazines for wrapping things and be sure to pack similar items together and label the boxes accordingly. Don’t overpack boxes, it’s easy to over-pack especially when packing books. When you come to pack the van, you need to do so with considerable care. You want a tightly packed interior with no room for things to slide about and of course, fragile items need to be on top. All that stuff you’ve had for years and never used, get rid of it. Sell it or give it to charity, either way, getting rid of it will save you time and that means it will also save you money. There may be certain items, such as furniture, for which there is no place in your new home, so don’t waste time moving them. Don’t just sign up with the existing providers at your new property. Before you move in compare quotes for broadband and utilities. Even though you might consider a house phone unnecessary, you may find that including a phone in your broadband deal can make it cheaper. When you’ve so many things to do, this may seem like an unnecessary hassle but switching providers can save you hundreds in the long run. Remember that companies always reserve their best rates for new customers. Depending on where you live, parking and loading a van can be a tricky business. On busy roads, you should inform the police and put out cones around the vehicle where you are loading. Try and time your move so that you avoid rush hour periods, this will save time and stress both during loading and on the journey itself. The less time it takes you to move, the less you’ll spend. The last thing your bank balance needs is for you to go on a spending spree for carpets, curtains and a new dining room set. Don’t feel that you must get everything at once, be prepared to make do for a while until you find what you really want. Keep an eye on your local charity shops or use sites such as Freegle to help you furnish your new home in the short term without a big cash outlay. A suitcase packed with everything you need for the next couple of days will mean that you don’t have to go searching boxes to find a toothbrush or rush out to buy supplies. Keep your paperwork for the house and move secure and readily available. Make sure you have all the important numbers in your phone – solicitor, removal company, van hire, utility companies etc. Make sure you have clearly agreed on how, when and where kets will be exchanged and make sure you have a number so you can contact the person who should be collecting or handing over the keys. Make sure you label all your boxes so you know what is inside and what room they need to be left in. Consider insurance to cover losses or breakages during the move.